Did you know there are 7,040 solutions in the Marketing Technology Landscape today? Organizations of varied industries like healthcare, finance and retail are all moving towards a common direction – innovative and measurable marketing solutions. With hundreds of new tools and solutions in market, can it be said the MarTech stack has reached its peak? 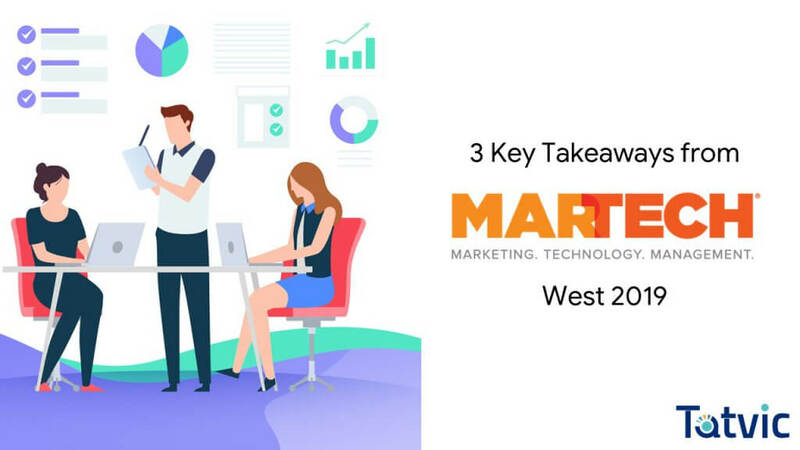 For those who could not be at MarTech West Conference 2019, let us bring to you some of the most valuable takeaways from three days of amazing keynotes, sessions and the expo exhibits. Personalization is a buzzword often heard in today’s business world. All the organizations are moving to become customer-centric over brand-centric. Being customer-centric goes beyond providing good services, it’s about keeping your customers at the centre of your business right from acquisition through conversion, as well as post-conversion. One of the most popular ways of personalizing user experience is running A/B tests. Analysts and engineers implement varied versions of website layout and personalize designs based on the output of these tests. But how effective is running multiple iterations of A/B tests to build personalized web pages for different user segments? Let’s consider a scenario, it might be evident that the users who select coupons on checkout stage have higher conversion rate over others, based on which a retail company decides to offer coupons to all customers who drop-off from the cart stage. However, there is a high possibility that customers might prefer specific types of coupons and would not convert with others. 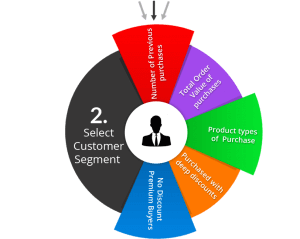 Sub-segmenting customers further proves out to be the most beneficial target for such personalizations. Data-driven audience segmentation is one of the most effective ways for offering real-time personalized experience. With Google BigQuery and Tatvic’s personalized targeting solution, it is possible to generate these segments in no time with least dependency on the technical team and highest data accuracy. Data is scattered all over the place in different CRM, Analytics and Marketing tools for even small-sized organizations these days. These are different stages of user engagement with a brand or business of the same journey. To enhance marketing strategies, it is very important to connect all these data points at a single location and study customer’s behavior in detail. It is a combined effort of Marketing, Sales and Customer Success ops to drive a successful customer-centricity. With a lot of tools available in market, organizations prefer tools or services that can be easily integrated with each other, with minimal cost and effort. This has led to the focus shifting towards platform ecosystem from disparate tools and technologies. The more data an organization can collect about their customers, the more effective personalized marketing and experience is built. 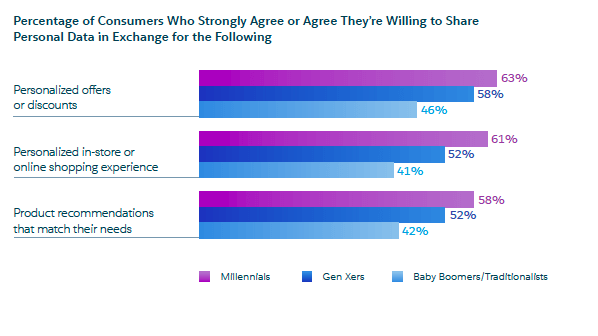 However, are consumers today ready to provide access to all their data and prefer companies doing so? It is very important for any business to make sure their customers are aware of the benefits they gain by sharing their personal data, and only use the data they have consent for. Explore how Marketing Analytics with Google Cloud can help marketers benefit from user’s data spread across different sources with complete security and access transparency. These solutions cover the entire workflow right from data collection, transformation, analysis and activation. Using customer’s past behavior data to realize future opportunities is a trend that a lot of marketers are following today. Predictive Analytics plays a key role in marketing activities like cross-selling, product/service recommendations, content engagement and above all remarketing. It helps set the accurate targets for different types of campaigns and predict customer’s conversion behavior. With so many artificial intelligence and machine learning tools in the market today, having the right services in place is extremely important for an organization. Also, these services should be faster and easier to use, so that marketers keep getting data real-time with negligible dependency on the data science engineers or programmers. 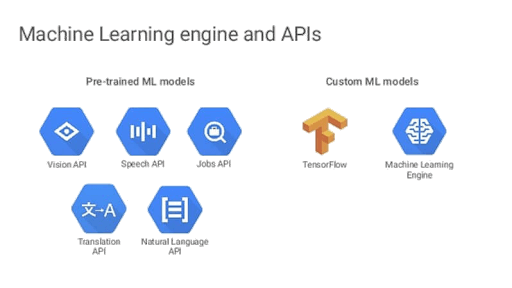 Google Cloud provides a wide range of pre-trained ML models in the form APIs as well as the ability to build custom models using its machine learning engine. Moreover, Google Cloud launched Cloud Data Fusion last week in Cloud Next 2019 where they showcased the power of BigQuery BI Engine, Connected sheets and AutoML tables. For a quick summary, Cloud AutoML is one powerful, minimal-code product that will help businesses with limited ML expertise to start building their own high-quality custom models. It will make AI experts even more productive and help less-skilled engineers build powerful AI systems they previously only dreamed of. Check out how Tatvic helped one of its customers to achieve 30% higher conversion rate with Predictive Analytics and Google Cloud Platform. Marketing Technology is at the core of organizations’ success. According to Gartner’s CMO survey, Martech contributes to nearly a third of marketing budgets, making marketing technology the largest area of investment for marketing resources and programs. It is not just about the amalgamation of IT and marketing, it is about how effective digital marketing can be when complemented by better campaigns and customer experience leveraged from data and analytical solutions.